Remember my friend Kris? The one who brought a plate of sprouts as a hostess gift? Which subsequently turned me into a sprouting fool? Well she’s also the woman who nudged me into beekeeping. It’s a hobby I’d flirted with, but until what I’m pretty sure amounted to Kris rigging a holiday gift swap so that a copy of Sue Hubbell’s A Book of Bees: and How to Keep Them ended up in my hands, I wasn’t really ready to jump in. As romantic as it sounded, I think there was something about boxes of stinging insects that gave me the heebie-jeebies. But guess what? I finished Hubbell’s book and I knew, almost certainly, that I wanted bees. Or at least I wanted a hive that I could sit and have a sandwich with. My heebie-jeebies were gone. Well, mostly gone. Gone enough for me to register for a two-day crash course in beekeeping at the University of Minnesota. Forty-eight hours with Dr. Marla Spivak (a renowned bee researcher) and her sidekick Gary Rueter put me over the edge. I came home, fumbled my way through building hive boxes and wrangling delicate wax sheets into wooden frames. Not really a hard job, but one with a bit of a learning curve for sure. Later that spring, I got a somewhat terse call from my local post office. It was 7:00 a.m. and they wanted me to know that three pounds of bees were waiting for me. Outside. In the back alley. I love that you can still order bees and chickens through the mail. It feels very pony express-like. Which, in a way, it sort of is. Most bees packages come via truck from apiaries in California. It seems like an arduous journey. The queen gets a luxury sweet, tucked into her own private little mesh cage with a few worker attendants to accompany her. The rest of the bees are stuffed into shoebox size, wood and wire box surrounding the queen. There are always a handful of unlucky bees who don’t get sealed inside. Amazingly, most of them manage to make the 2000+ mile journey clinging precariously to the outside. It is, of course, best if you can install the weary travelers into their new home as soon as possible. 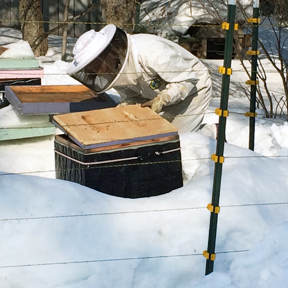 From the few times I’ve ordered bee packages though, I’ve learned that the arrival of bees almost always triggers a major weather event—typically a blizzard. So if need be, they can spend another few days tucked inside somewhere. A few spritzes of sugar water through their wire mesh is all they need. Getting the bees situated is a pretty painless job. At this point in the game, they’ve got nothing to protect and are simply looking for a place to set up shop, which means they’re mild mannered. All that’s required is to pry open their wooden top, remove the mini-queen cage (tucking her safely in a warm pocket is a good idea) and give the box of bees a good upsidedown whack into an empty hive box. The bees (about 12,000 of them) literally just pour out. I remember Gary from bee class instructing to use the hive tool (a mini crowbar-type tool) to spread them around, “just like pizza sauce.” Which is of course what I now visualize every time I spread pizza sauce. Thanks Gary. Frames of foundation—containing the same delicate wax sheets you toiled over weeks ago—are added to the hive, and the queen gets nestled in last. Then it’s best to shut up the hive and let them acclimate to their new surroundings. If the weather cooperates, they’ll be out flying and getting down to business within a day. I’ve been lucky. I’m going into my tenth year of beekeeping and I’ve only had to buy a handful of packages. My overwintering success has been good, allowing me to split and divide them to make new hives as they grow. But I almost always have to nurse my bees along a bit in the spring. After a few months of well deserved rest, the queen—miraculously perceiving a change in season—resumes laying eggs in February. This means by March there is a growing number of baby bee mouths to feed. And where I live, the first dandelion doesn’t typically bloom until well into April. Sometimes even May. So if the hive is low on stored honey, they can starve to death, right when things are beginning to look hopeful. I bring any hive that seems like they need it a homemade sugar snack to get them over the hump until the nectar is flowing naturally. Their treat is a simple boiled sugar mixture that, in candy making speak, has reached the soft-ball stage. 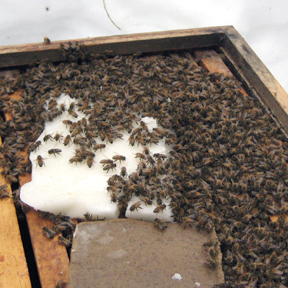 What results is a nice, moist, pliable sheet of bee candy. I also slip my hives a “pollen patty”—a substance that mimics the protein structure of real pollen–which the bees use to rear their young. So even though spring officially arrives on scene today, I was in the kitchen making sugary, glossy bee treats. And since I was already there with an apron on, I also whipped up a small batch of honey shortbread cookies. After all, I’m going to need something to accompany that first sandwich of the season out at the hives, right? Happy spring friends! The lavender is optional, but I was feeling particularly springy, and it seemed like it would be a nice floral addition. It was. Like most shortbread, these are not overly sweet and are great for dunking. Toast the pecans on a cookie sheet in a 325º Foven for 8-10 minutes. Let cool and pulse them in a food processor with the lavender flowers until they are ground up, but still a little coarse. Let dough come to room temperature for a few minute before forming into roughly 1-inch balls. Flatten with a flat bottom glass dipped in flour. Bake about 18-20 minutes in a 325ºF oven until lightly browned. 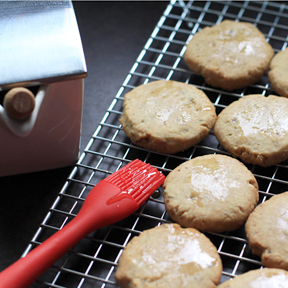 Remove from oven and while cookies are still warm, brush their tops with honey. Makes about 15 cookies. Recipe doubles easily.